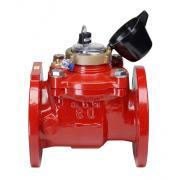 2" 'WMR' Water Meter model #36WMR2T10 8.8 GPM to 110 GPM | Wyatt Irrigation Supply, Inc. 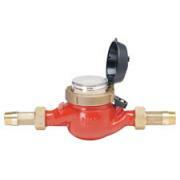 The WMR Water Meter is one of industry’s smallest water meters. The ample space around the core of the in-line helical axial turbine allows foreign matter to pass through the meter without clogging. This wide clearance produces full pipe flow measurements and is very accurate over a wide range of flows. Available in 2” size. Magnetically driven sealed registers are stainless steel/glass encapsulated and guaranteed against fogging due to moisture. Very accurate over a wide range of flows. Industry’s longest warranty – three years on the metering components (register and metering assembly) and five years on the meter body.